Passive optical LANs use standard FTTH architecture and protocols which are quite different from typical LANs. In a Ethernet LAN with structured cabling architecture, Ethernet switches in the main equipment room connect to routers for Internet connections and servers in the corporate data center to provide data for users. 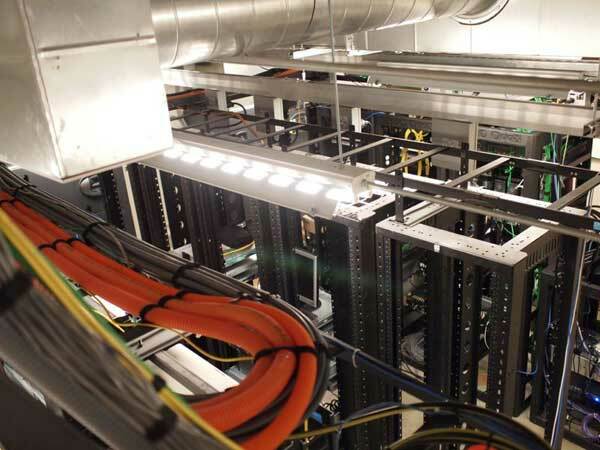 Users are connected on a multi-link system that uses backbone cabling to connect the main switches to local switches in the telecom rooms near the users. 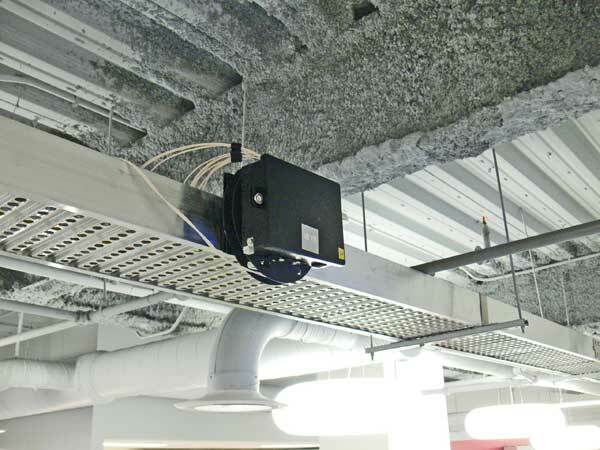 Users will then be connected over horizontal cabling, usually UTP which runs from the telecom room to the work area. The telecom room requires uninterruptible, data-quality power, special data grounding and usually air conditioning to keep the temperature in the telecom room under control. 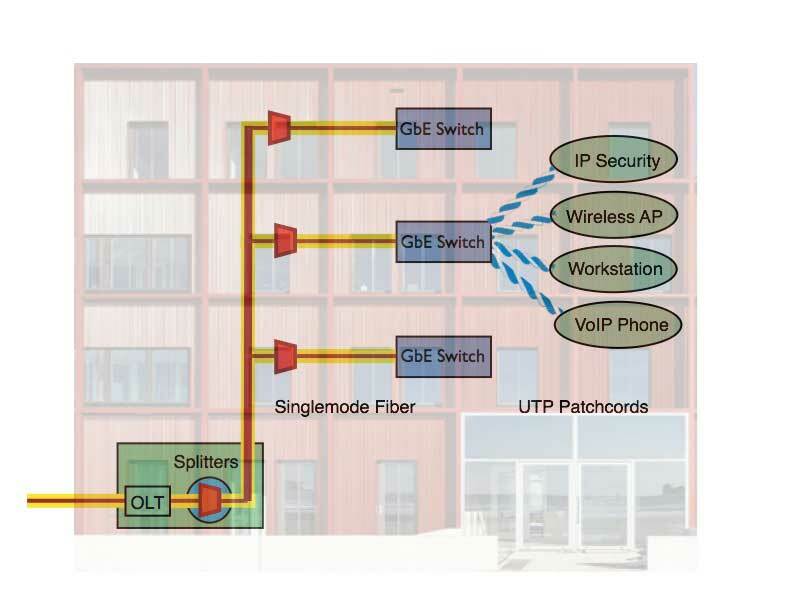 Passive optical LANs use a different architecture than LANs with electronic switches. 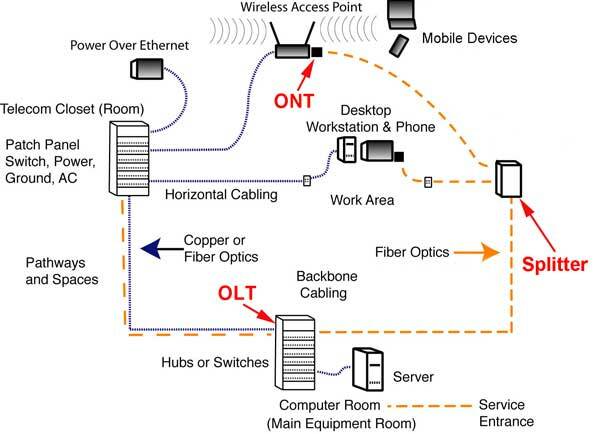 Passive optical LANs use optical splitters to divide the optical signal to allow up to 32 devices (ONTs) to be connected to one port on the optical line terminal (OLT) that is the center of the LAN. Downstream, the splitter splits the signals to all the devices and upstream it combines them into one fiber, allowing bidirectional signals on one singlemode fiber. Each ONT is usually a 4-port gigabit Ethernet switch in a LAN, but it can also be a switch for multiple phone lines or even a FTTH triple play (phone/Internet/TV) converter. Passive optical LANs use internationally standardized systems called GPON (Gigabit PON) or EPON (Ethernet PON) with GPON the most popular now (October 2013). A GPON system is shown below. A POL cable plant needs nothing but passive components - fiber optic cabling and a splitter - between the main equipment room and the work area. 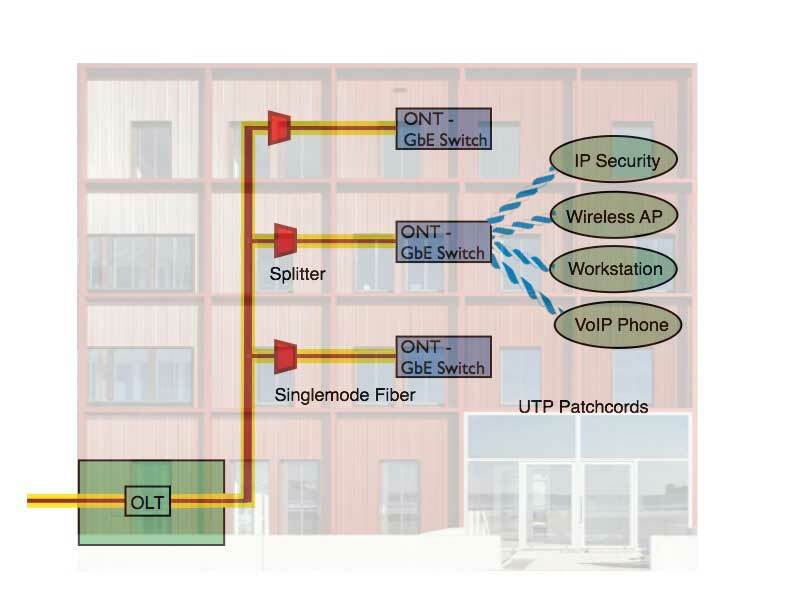 Signals are transmitted simultaneously in both directions at two different wavelengths on a single fiber using wavelength-division multiplexing (WDM) so each work area needs only a single singlemode fiber to connect to the network. FTTH passive optical networks use fiber optic splitters to split out a downstream signal to a number of users, usually 32, reducing the complexity of the electronics and the bulk of the cabling, plus it spits the cost of the downstream electronics by the number of users, making the cost per user much lower, even lower than a link using copper cables between Ethernet ports. Upstream, the POL uses the coupler as a combiner - combining the incoming signals into a single fiber to connect to the OLT. Each user work area has a ONT that uses an inexpensive 1310nm laser for upstream signals. In both directions the system will work with ~13-28dB loss and most of the loss will be in the coupler. With a design specification of 10km links, POLs offer maximum flexibility to users spread over a large geographic area, not just a campus but large manufacturing plants or even a small city. When talking to IT techs, we generally explain that the PON splitter serves the same purpose as a switch but requires no power/ground/AC and takes a fraction of the space. A block diagram of a typical POL system. Splitters can be cascaded for the 32X split ratio to split nearer work areas to reduce cabling. If we split the downstream signal to 32 users, how does each user get their specific data? The data is transmitted downstream (at 2.4Gb/s in GPON, currently the most popular FTTH network used for POLs) using time division multiplexing and - this is important - each user's data is encrypted to prevent other users from intercepting their data. The combination of fiber cabling and encryption makes POLs highly desirable for those concerned about secrecy and wiretapping. 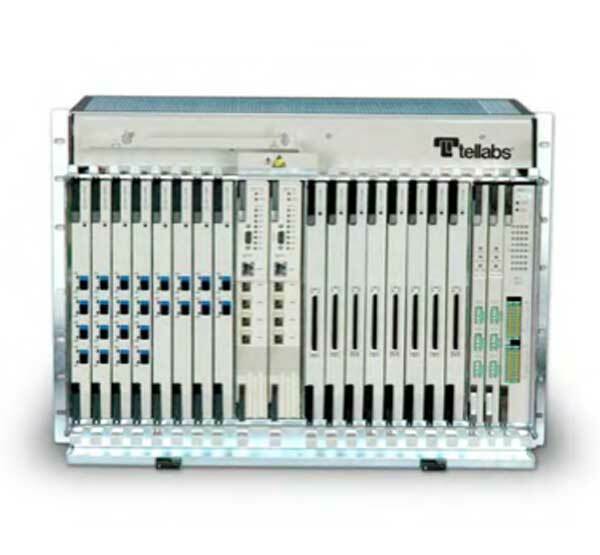 The downstream multiplexing can dynamically allocate bandwidth as needed. Upstream signals in GPON are at 1.2Gb/s. Higher bit rate GPON and EPON (PONs that use Ethernet protocols) are being developed. ONTs in LANs usually incorporate 4 gigabit Ethernet ports (1000base-T over Cat 5e patchcords) but other options are available. A triple-play ONT from FTTH gives voice/data/video outputs. Multiple POTs phone ports, more or less Ethernet ports, etc. are available from various vendors. The ONT is powered locally and can incorporate power over Ethernet (PoE) to power local devices like WiFi access points, voice over IP (VoIP) phones or video cameras. Having local PoE provides the convenience of PoE without the high power losses encountered in long horizontal cable runs. Those experienced in typical Ethernet LAN hardware may have trouble believing the hardware for POLs. The OLT that connects all the users also includes connections for outside services (telco and Internet). In fact, most OLTs are designed for one or more 10Gb/s connections, hardly the typical slow T1-T3 or 10-50Mb/s available through routers for most LANs. the size of the hardware is also amazing as shown below. This small rack mounted system can support 2000+ connections with splitters which connects ~8000 users via 4-port switches at the work area. Compare that to the room full of Ethernet switches to support 8000 users! Even smaller units are available to support fewer users. At the work area, small switches about the size of a cable modem or DSL modem are common, but switches that fit in a wall outlet are also available. POLs are adapted from telco systems that are designed for 99.999% reliability, at least 10X normal LAN components. UPS power is required only at the main equipment room and at the user work area if desired. No power is needed at any intermediate point like traditional structured cabling requires for switches in a telecom room. Redundancy can be built into systems using splitters with two inputs instead of one, with each input connected to a separate OLT for backup. As mentioned above, signals are encrypted downstream and systems that encrypt upstream and monitor fibers to detect tapping are available for high security areas. One question that often arises is how passive OLANs fit into the usual structured cabling standards. These networks are recognized by standards groups and in fact are fairly simple variations of the usual cabling architecture. This is a basic diagram of structured cabling as defined by TIA-568 or ISO/IEC 11801. 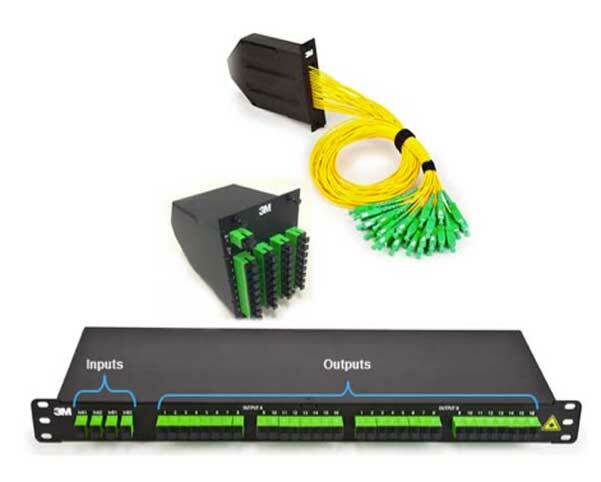 A passive optical LAN based on PON FTTH components simple adds a passive splitter to the cable plant architecture (which can be considered either centralized fiber or a singlemode fiber backbone) where other networks would only have a patch panel. Most buildings designed in the last 20 years have been designed around structured cabling with large areas set aside for pathways and spaces, most of which are not necessary for OLANs. Some OLAN users have actually recovered spaces allocated for telecom rooms. Cable trays emptied when obsolete UTP cables are removed for recycling can be left since removing them is costly. Older buildings that were designed before structured cabling standards that have always been difficult to install cabling systems are much easier, obviously. Perhaps the best example of the savings in cabling bulk when using an OLAN is this photo taken of the computer room at the San Diego Central Library. Note how few cables are visible - just a few ducts for fiber optic cables. More photos of the San Diego Library showing the total installation before and after opening are here. As we mentioned above, OLANs are using only singlemode cables which are easy to install but require special termination procedures (generally prepolished/splice connections) or using prefab cable assemblies. Many of the components are similar to those developed to ease installation of FTTH (as shown here). Manufacturers have also developed special hardware to simplify the prefab cable plant installation like the module shown below. Testing POLs is easy for insertion loss but requires special knowledge with OTDRs as they splitter can be confusing. Cable plants with splitters have different characteristics upstream and downstream so techs should be trained on the special needs of POL testing with OTDRs. FOA has an Optical LAN (OLAN) specialist certification (CFOS/L) with training available from FOA approved schools and an application certification available online.